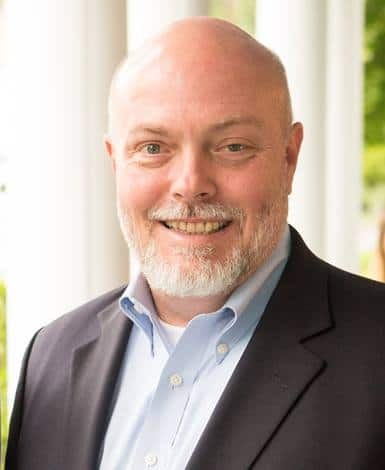 This past Friday, I reported that Dr. Thomas Ferleman, a Montgomery County Council candidate running in the District 2 Republican primary, deleted and blocked two men from posting comments on his public campaign Facebook page. 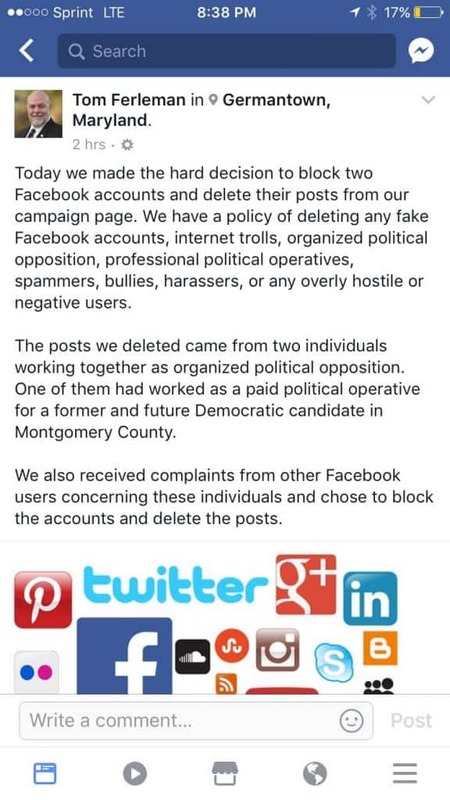 The two now-blocked Facebook commentators – Sean Branchaw and Kevin Kelley – responded to Ferleman’s June 8 Facebook post in which Ferleman posed a question to the Montgomery County Council with a linked CNN article asking the Council what it intends to do in the aftermath of the two Montgomery County high school students who were shot dead a day before they were slated to graduate. Branchaw and Kelley’s comments (see below) were quickly deleted from Ferleman’s public campaign Facebook page. I sent Ferleman a request for comment on Thursday evening via Facebook Messanger, asking him why he deleted the two seemingly innocuous comments/questions, but he refused to issue any statement. I reached out to Kevin Kelley – whom Ferleman accused of calling his home and harassing his family – for comment. In an email sent to me on Friday afternoon, Kelley said that he did call Ferleman on Thursday evening (he had Ferleman’s phone number because he’s known Ferleman for several years) and stated that Ferleman threatened to pursue legal action against him if he called once more. Absolutely, thanks for reaching out to me. I truly appreciate the opportunity. I’ve seen your story and I applaud you. I did call him (I only spoke to him, not to any other family members, and I know his family personally so I have his number). I took lessons from Comey and wrote notes about our conversation immediately after. To be clear: there was no shouting or sexual language on either side. Sure, I was angry and I’m certain it showed through my voice, but I was speaking at a normal volume. I don’t know how he could have interpreted anything I said as sexually explicit language. Tom: Why are you calling my house?” He was calm and composed, albeit there was tension in his voice. I said I didn’t appreciate unwarranted, inaccurate attacks against me coming from a public Facebook page, and asked that the post be corrected or taken down. I informed him that I despised working for Trone, as my old coworkers will attest, and to claim that I’m still a worker for Trone is laughable (the last time his campaign paid me was late April, 2016). I told him that Sean (the other person he blocked) works for the Trump administration, so calling him a Democratic political operative is absurd. He didn’t engage my topic of conversation. He expressed displeasure that I was calling him, and told me to never call him again. I’ve chosen to stand against the Montgomery County MD Council and the entrenched establishment. With your help we will bring commonsense leadership back to the County Council. Then I abruptly hung up. I have made no further attempts to contact him or his family (besides his son, who is a good friend of mine and we talk regularly), and I have no plans to either. He also described me as a “boy” in one of his following Facebook comments, which I don’t care about, but it’s certainly not a descriptor made my an unemotional party. To me, this episode is ridiculous. I’ve known Tom for 12 years; I’m not some anonymous troll that illegitimately dug up his phone number and threatened to kidnap his dog. Threatening legal action if I call again (which he has every legal right to do) is outlandish and gravely personal. Furthermore, he’s holding me to quite a standard, but I’m not the one running for office. Private citizens aren’t supposed to be called out by politicians, especially for asking a simple question. If he didn’t want to answer my question, he should have just ignored it. Blocking me was unneeded. You just wrote an article about Tom Ferleman deleting Facebook comments, and as one of the individuals deleted, I just wanted to offer more information in case you continue to follow the story. 4) The extent of my “organized opposition” was a total of maybe three responses to Ferleman’s FB posts over the period of about six months, all of which were polite and civil. This most recent one didn’t even take a stance! Also, I know of at least one other person who has been deleted and blocked from his twitter account for asking legitimate political questions. He has blocked Kevin and I so that we can’t even comment and share what happened. Just in the last few minutes, another friend added a comment that was deleted this morning (attached for reference). It scares me that he’s attempting to censor any voice he doesn’t like considering that he’s running for public office! Yesterday morning, I reached out again to Ferleman – this time, via email. I forwarded to Ferleman Kelley’s statement and offered him an opportunity to comment. I quickly followed up, sending Ferleman a second email asking if he regrets deleting Branchaw and Kelley’s Facebook comments and if he threatened Kelley with legal action. Ferleman has not responded to my questions as of Sunday morning. For more information about the Montgomery County Council races, please continue to follow AMinerDetail.com for the latest news and updates.